Pisces is made up by two separate entities, which, in their animal form, are huge sea creatures resembling fishes with elongated bodies similar to those of eels. Their general look is vaguely reminiscent of koi fishes'. The two of them appear from an ethereal vortex generated behind the one employing their key. Both share similar traits, possessing large, wide, open, and round eyes with dark pupils sitting at their heads' sides, and massive mouths with light, thick lips full of squared teeth. A number of fins are also present on their bodies, with a series of long, jagged ones crossing the whole length of their upper part, almost reaching up to the top of their heads, and a smaller, more squared fin located on the ends of their faces, one on each side. Their bodies are covered in lines crossing their whole length, with each line being flanked by a row of spots; more spots form a single, hinted semicircle above each eye. What distinguishes the two fish is the color: the one to the right from the portal is light and sports dark markings; the other one, on the contrary, has light markings covering its dark body. Both creatures bear the symbol associated with the constellation of Pisces on their forehead, respectively dark and light in color. Is a slim young woman of average height possessing long, straight and glossy dark hair, reaching down to her middle back, which is gathered above her forehead in a prominent front bun, but is left to freely flow backwards on her shoulders in two strands. She possesses slanted dark eyes, each linked to the corresponding side of her face by a linear tattoo which forks in proximity to the eye, and two dark protrusions reminiscent of membranous fins sit at her head's sides. Hers is a very curvaceous figure, with her ample breasts being hugged and partially exposed by a revealing top made of massive light scales, going from her waist to her neck while baring the central part of her torso, with shoulder pads extending on her shoulders. The woman's arms are covered by light-edged dark sleeves adorned by intricate, light decorative motifs; these very same motifs are present on her full-length, mildly loose matching pants, while her feet are covered by plain, dark open top shoes. Her forehead is adorned by a light, simple crown, bearing a massive light gem on the front. She is rather attractive. While Pisces is in its human form, the son seems to have a comedic habit, using "mom" to refer to not only his mother, but also those who summoned the two of them, much to the amusement of his parent. 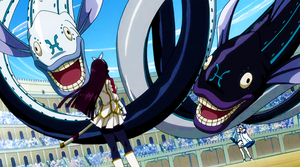 The son is cheerful and go lucky he loves to have fun and enjoys wielding his trident into battle against strong foes. The mother has a cheerful disposition much like her son and enjoys a good laugh and having fun. She enjoys teasing others through the use of her looks.